Monkey face drawn with a comb and diluted acrylic by Lazaro. 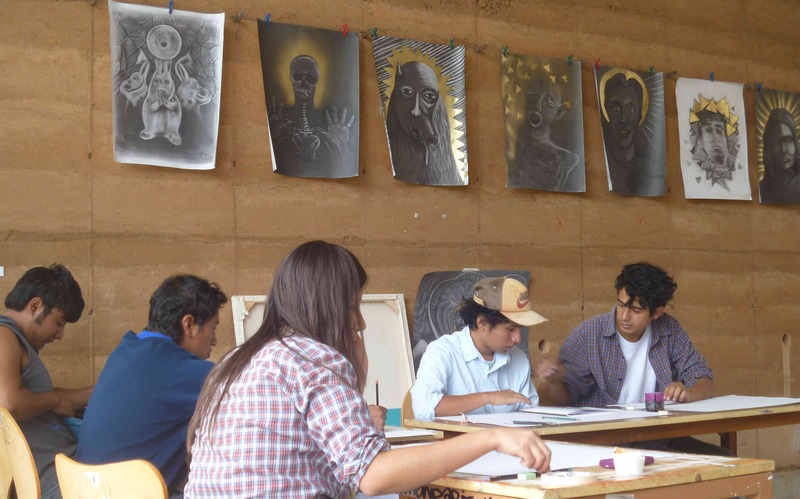 This week I taught a 3-day experimental drawing workshop at UABJO, University Benito Juarez, Oaxaca. I love the rainy season here in the mountains of southern Mexico. The workshop was in conjunction with the Kutztown Print exhibit that opened with much fanfare and mescal. Students at UABJO. Left of me is my co-teacher, Maestro Memo Rito. Fortunately, I got help from my old Maestro from the School of Visual Arts, Marshall Arisman, chair of SVA’s MFA Illustration program. Months ago, during a busy Spring semester Maestro Miguel Angel Ojeda at UABO asked me to teach a summer workshop. Without much thought, I picked a topic: Experimental Drawing. 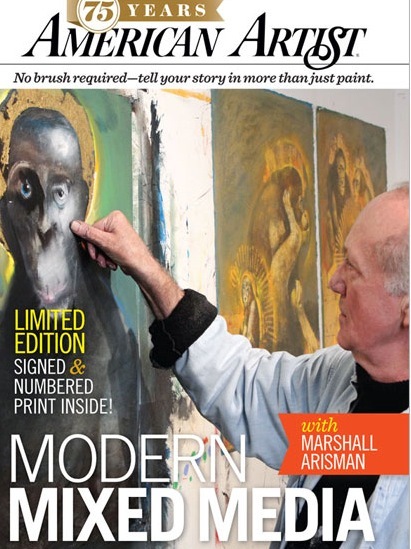 Thank heavens, I recently bought Marshall’s DVD, Modern Mixed Media. The video is far superior to most how-to paint or draw videos. Marshall shows his process of internalizing his subject matter through sculpture, drawing, and painting. I must say I had to improvise with materials. 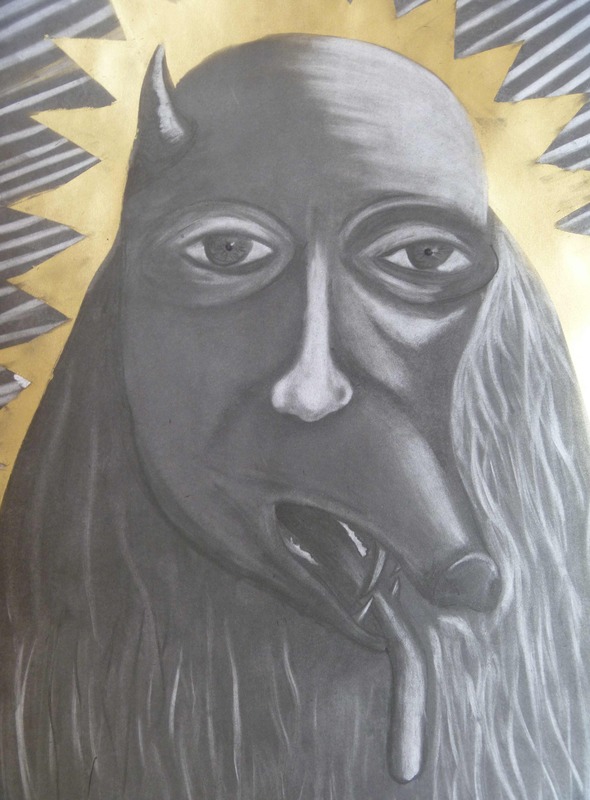 Marshall uses paper-mache, india ink applied with bits of cut comb, and oil paints. He even uses gold leaf and a powdered pastel painting product that comes from a Kutztown-based business, PanPastels. 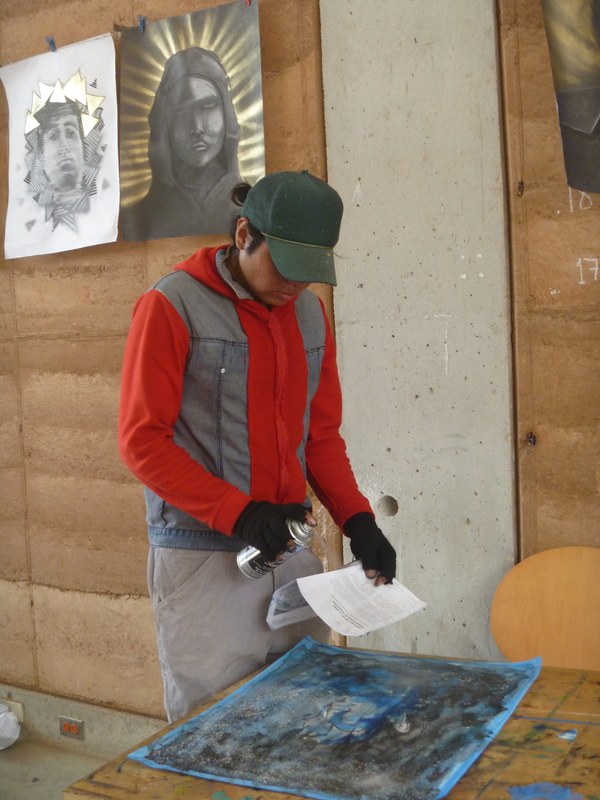 Oaxacan student at work using a piece of comb to draw. I had one sample of PanPastel to share. Paper-mache, -they got plenty, but gold leaf is out of the question. 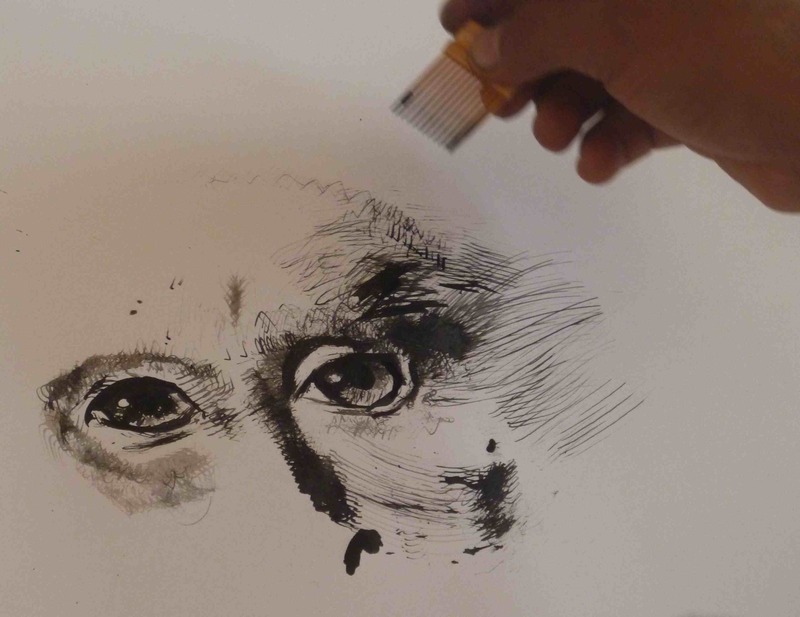 Here in Mexico, even india ink is a luxury item for art students. The india ink I carried down leaked in my luggage on the plane (stuff happens), so we substituted diluted acrylic paint. The class was over-enrolled, so I went to the Oaxaca’s central market to get some more combs. 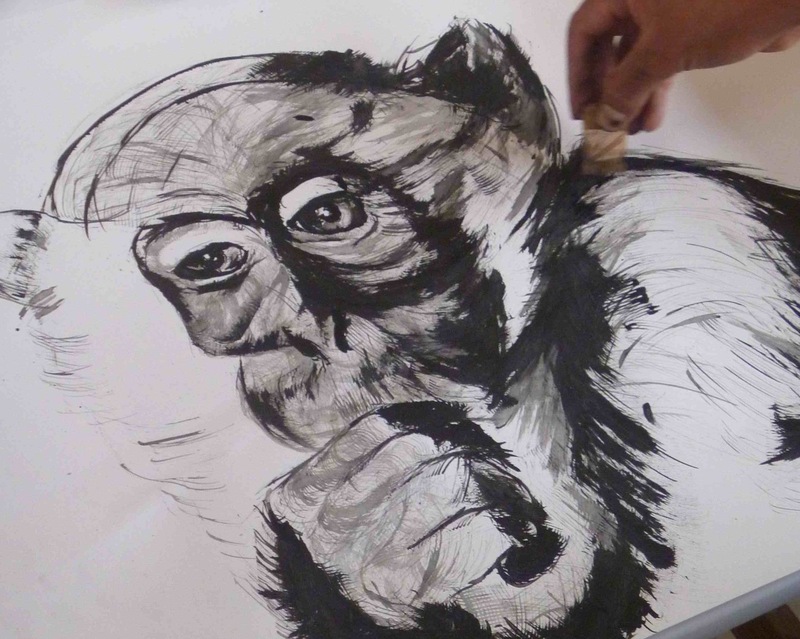 The Oaxacan students watched portions of Marshall’s sacred monkey drawing demos each morning with rapt attention. Then we adjourned to the gallery for our drawing workshop. We substituted powdered graphite for PanPastels to recreate Marshall’s subtractive drawing exercise. The results were, of course, far less colorful, but we managed to explore the process. For our gold leaf halos, Cesar Chavez lent a can of gold spray paint from his graffiti supplies. We had a great mix of students, from teaching assistants to street artists, and the results were amazing. For me, it was a wonderful experience. Artists and teachers are held in high regard here in Mexico. Oaxaca, in particular, is a mecca for the graphic arts. I was interviewed on radio, TV, and both daily newspapers. If you read Spanish or want to view a slide show of the workshop check this story in Noticias. By the way, this is not the first time Marshall Arisman saved me. Long ago, when I applied to SVA’s MFA program I didn’t have my Bachelor’s degree. Marshall let me in on one condition: that I complete my Bachelor’s pronto. He changed my life, for the better.